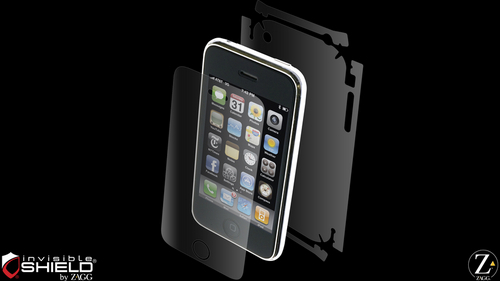 The high priced screen protector originates from military technology designed to maintain helicopter blades in different environments. Because of this it claims to prevent anything from scratching your iPhone. Additionally, it’s more than a stick-on screen. It requires a tedious process in which the user carefully cleans the iPhone, attatches the screen protector, blowdrys it for a perfect stick, and then carries the iPhone in a special bag for a few days as the plastic hardens. Best of all, to back up the claims, ZAGG offers a lifetime replacement guarantee. After using the ZAGG invisibleSHIELD for a few months I noticed a few light marks on the screen protector. I had thought the protector itself would not scratch, but I have later learned that it can receive a few dents. These don’t significantly take away from the iPhone appearance and thankfully prevent scratches on the iPhone itself. While protecting the iPhone from scratches, the ZAGG invisibleSHIELD does have some significant downsides. First and particular to the iPhone 3GS, the screen protector does not stay attached very well. This is due to the iPhones oleophobic coating (literally meaning “scared of oil”) which helps prevent fingerprints. Sadly, it also keeps the ZAGG invisibleSHIELD from staying attatched for more than a few months. In my case, it slowly started peeling from the bottom which let in air bubbles and made my iPhone look cheap. At month six, it had peeled off halfway and folded under losing all practical value. Finally, since the ZAGG invisibleSHIELD does not have an oleophobic coating itself, fingerprints show up very quickly. Is the ZAGG InvisibleSHIELD Worth Your Time and Money? In the end, I paid $24.95 for the screen protector plus forked over $10 for “professional” installation at a mall kiosk so that I wouldn’t mess up the tedious process. I am very thankful for the reduction in scratches, but did not expect the screen to peel off so easily (the installation is not refundable) and was saddened that my friends’ iPhones without the screen protector looked and felt much sleeker. When I called the company to discuss my experience, I was told I had to either pay another $10 for a third-party installation or do it myself. Also, they reminded me that the free replacement cost $3.95 for shipping despite the fact that it can fit easily in a standard envelope, and they would hold a charge on my credit card for the replacement until I returned the original (to prevent someone from gaming the system). After pointing out the problems specific to the iPhone 3GS and letting them know I would be letting all my loyal blog readers (thanks everyone!) know about my experience, they decided to make the shipping free and not place a charge on my credit card. I really just wanted a refund, but apparently that was asking too much. I’ve never used this product, but the vibe I get from reading your article is that its meant to be a permanent screen protector. To me, the value of having a permanent screen protector is similar to the value of painting a wall so the original paint underneath doesn’t get scuffed up. Whats the purpose if you never see the original paint anyways? A temporary screen protector makes more sense for an iphone. It gets scuffed up, you remove it, and then buy a new one. Also, why do companies give better customer service when their customers push for it? For example this company said they would charge you for shipping, then you told them you disagreed with that and would be publishing a review of their service. “Oh wait, yea we can give you free shipping.” I understand that good companies should have an attentive ear for what their customers are saying, but actions that reflect good customer service should be protocol, not the exception. If I have to beg for good service, then its not good service. Thanks Tyler for your comments. Good point regarding the life of a screen protector. I think the InvisibleSHIELD is supposed to be a lifetime product for the iPhone and if the replacements were truly free then this would be the case. It’s also sad like you said that customer service only helps people who take the time to complain about faulty products. It seems to me that if the company knows a problem exists and does nothing then they are just hurting their customer base in the long run. There are no screen protectors on the market that last forever. We at NuShield tell our customers that the film only lasts about 6 months, but we provide two easily self-installable films for only $14.99. Much better value for your money. Also, the NuShield DayVue film has anti-reflective properties that allows you to read the screen even when you’re wearing polarized sunglasses. No other screen protector can make that claim!! If you would like to try our film and see the difference between a DayVue and a Zagg, please let me know. And we would not charge you for the film!! Thanks Andrew. I’m looking forward to trying your screen protector soon! My husband has had two iPhones – the 3G and the 3GS in white. I installed the Invisible Shield on the first one, and it did start coming off at the edges six months or so. We paid for professional installation for the second one, and it has stayed on clean for about nine months. I did eventually peel off the back panel, because it was getting dirty and grey around the edges, and this really marred the appearance of the white back. Thanks for the comment Mandy. I’m glad the professional installation worked for you Based on other review I have read the product seems to be fairly good and my experience doesn’t happen all the time. I was most upset with the level of service I received and the fact that I would have to pay again for installation or a new shield. Also, NuShield, a competitor of Zagg, is sending me their screen protector for free to try and review. They also let me know that they provide refunds including shipping. I am hoping that their product is as good as their service.